So the boy hands her a book, she opens the cover, then looks in and says, “Oh my God… it’s a first edition. You can’t give me this.” When the camera zooms in on the book, it’s a “first edition” of Homer’s Iliad. Of course, since the Iliad was originally written on scrolls in Greek some centuries before Christ it’s very unlikely that the boy was giving her a first edition of that book. But let’s be more generous than that. Let’s just say that the boy gave her a rare first edition of an English translation of Homer’s epic poem. There are some famous ones out there: John Dryden, Alexander Pope, Matthew Arnold. A first edition of any one of those could conceivably be worth quite a bit of money, and who knows? Maybe someone would find one in a garage sale somewhere. Unfortunately, the book pictured isn’t even that. It’s an edition of Homer’s Iliad published by Thomas J. Crowell & Co. for their Red Line Poets series. I own copies of their editions of Percy’s Shelley’s works and of Byron’s works. The photo to the right is of a flyer stuck inside my edition of Shelley that advertises the series. 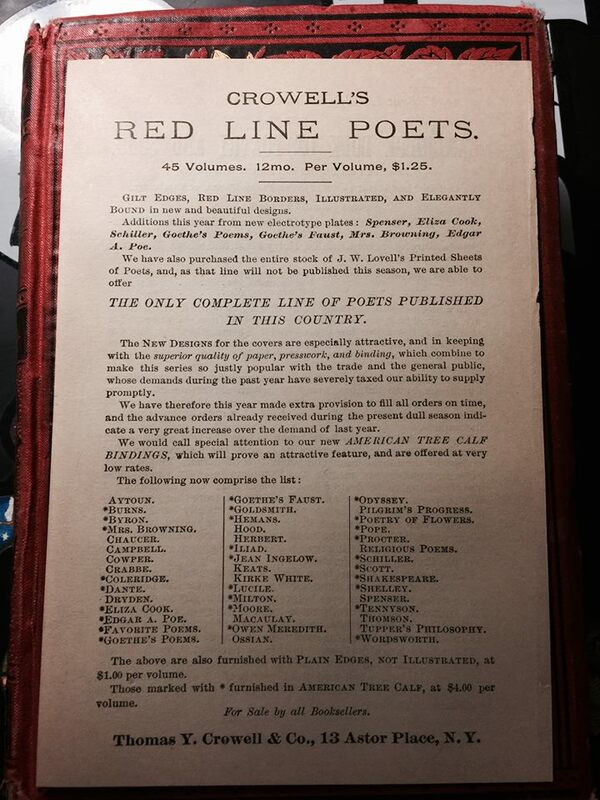 While it is a nineteenth-century edition, Crowell & Co. having published all 45 titles in the Red Line Poets series by 1882, they originally sold for $1.25 each and typically go for around $8.00 in used bookstores today. The Red Line edition of the Iliad sold for $4.00 at the time because it was bound in calfskin. It might really go for $1.00 in a garage sale, and it’s certainly attractive and would make a nice gift, but no one’s going to empty their bank accounts for one. You can read more about different Red Line Poets editions on this University of Iowa page. Next Next post: Jack White Quitting Rock!